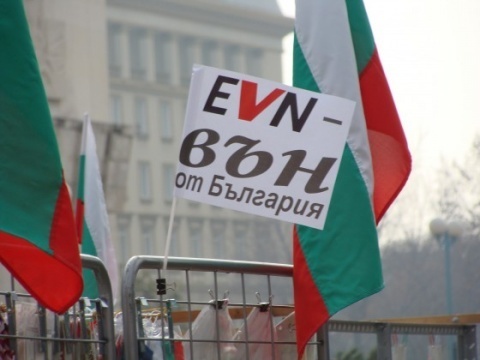 Protestors across Bulgaria have demanded the nationalization of Bulgaria's three power utilities – CEZ, EVN, and Energo-Pro. The deadline they set for the government is quite tight – February 22. Tens of thousands of disgruntled citizens rallied on Sunday across the country in protest against the excesses of power and heating utilities. In 2004, the Balkan country sold 67% in its three power distributors to Germany's E.ON, Austria's EVN and Czech CEZ. E.ON served households in North-Eastern Bulgaria, including the Black Sea city of Varna. Czech power utility CEZ supplies power to over 2 million households and companies in western Bulgaria, while EVN serves the southeastern parts of the country. At the beginning of December 2011, German electric energy company E.ON struck a deal to sell its Bulgarian unit E.ON Bulgaria to private Czech company Energo-Pro. Experts repeatedly called on the Bulgarian government to launch high-quality initial public offerings to bring back to life the capital market, dented by low liquidity and lack of quality stock, as well as to boost revenues. That's why the sale of the minority stakes in the electricity distributors on the stock exchange was a must-do task for 2012. The Bulgarian state made a total of BGN 115 M from the sale of its minority shares in Czech-owned power utility CEZ Bulgaria on the Sofia Stock Exchange at the end of last year. Bulgaria's privatization body formally declared the successful end of the sale of the state-owned shares of CEZ Bulgaria on the Bulgarian Stock Exchange, which took a week to materialize even though the deadline was November 29, 2012. Bulgaria has thus sold all of its 33% stakes in two newly listed local power distribution companies controlled by Czech power firm CEZ. Bulgaria had sought to rake in at least BGN 104.3 M from the sale of the government's minority stake in CEZ local power distribution units. It offered 63 624 shares in power distributing unit CEZ Distribution Bulgaria and 1650 shares in grid operating unit CEZ Electro Bulgaria. The minimum price per share was set at BGN 1415 and BGN 8660 respectively. The sale of the two power distribution companies controlled by Czech electricity producer CEZ brought to an end Bulgaria's privatization of its 33% minority stakes in all three power distributors. Bulgaria had before that sold its minority stakes in power distributors controlled by Czech Energo-Pro and Austrian EVN for BGN 67.6 M and BGN 93 M respectively. Both companies acquired the bulk of the capital of its two units in Bulgaria right after the trade with their shares started on the local stock exchange, boosting their 67% stakes held before the launch of the sale.